AFCEA conference "Protection of critical infrastructures: the SCOUT workshop"
Under the 7th Framework Program and the European Horizon 2020 program on security and secure societies, SCOUT, "Multitech Security System for Interconnected space control ground stations", is a European project funded under the 7FP, aimed at the physical security and logic of satellite control stations although, it is a dual technology, can be used for the protection of each both civilian infrastructure and military. The project was carried out by a consortium led by the national laboratory RASS (Radar Surveillance System ans) of CNIT (National Inter-University Consortium for Telecommunications) together with nine partners from six different countries. Started in 2014, the project will end in April 2018. 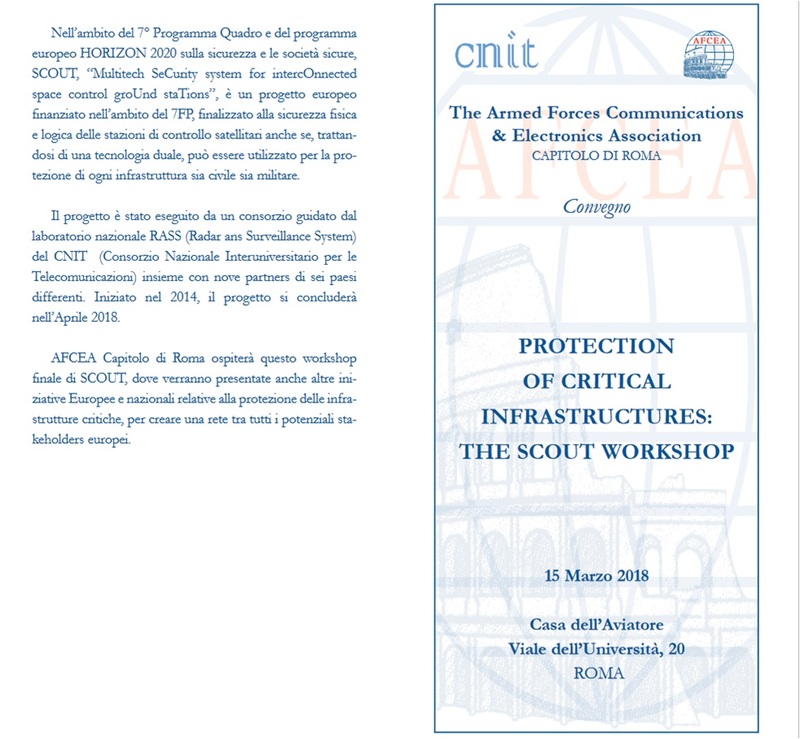 SAURON Project was presented during the Protection of critical infrastructures: the SCOUT workshop by a VPORT representative. The European Critical Infrastructure Protection Program (CIP), part of the broader Common Security Defense Policy, reflects the essential need for EU member states to address threats in crowded areas and ensuring business continuity to security and infrastructure cruciali.La the resilience of the European critical infrastructure must be guaranteed in order to avoid any interruption during the operational phases may determine the collapse of large sectors related to our activities.